A native of Scranton, Chris is a graduate of the Scranton Preparatory School, Wilkes University where he earned a Bachelor of Arts Degree in English Literature as well as Northampton College where he earned an Associate of Applied Science Degree in Funeral Service Education. He also attended graduate school at the University of Scranton. He has earned accreditation with the American Board of Funeral Service Education. 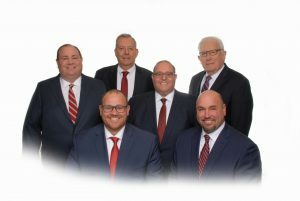 Proud to serve families throughout Northeast Pennsylvania with his brothers Brian and Mark, Chris also serves as the president of the James Wilson Funeral Home, Lake Ariel, PA and a principle in the both the Lake Region Crematory and the Northeast Pennsylvania Pet Crematory. Active in the community, Chris has held numerous board positions with various civic, fraternal, educational and religious organizations. He and his family are active and dedicated members of the Immaculate Conception Church Parish. He resides in Jefferson Township, PA with his wife Erin and their two daughters Grace and Claire. A native of West Scranton, Bob is a graduate of West Scranton High School, Keystone College and the American Academy McAllister Institute of Funeral Service. A proud licensed funeral director for over 50 years Bob has served the funeral service profession on the state and local level culminating in his being the President of the Pennsylvania Funeral Directors Association. Just as community minded he has served on various civic, fraternal and religious boards and he and his family are dedicated and active members of the Covenant Presbyterian Church in Scranton. He and his wife Genie, along with their family reside in West Scranton. Brian is a graduate of Scranton Preparatory School and The University of Scranton where he a earned a Bachelor’s Degree in History. He is the President/Manager of Lake Region Crematory at the James Wilson Funeral Home. He is a member of St. Paul’s Parish in Scranton. He and his wife Katie reside in Dunmore with their children: Brian Jr., Edward, Patrick, Maggie, and Kathleen. A graduate of Scranton Preparatory School, Mark also earned a Bachelor’s Degree in Business Administration from The Pennsylvania State University. He is the President/Manager of Northeast Pennsylvania Pet Cremation Services, Inc. at the Milton James, Jr. Cremation Center and James Livery Service, LLC. He is a Wayne County Deputy Coroner. He also serves on the Board of Directors of the Wayne County Community Foundation. He is a member of St. Thomas More Church, Lake Ariel Lions Club, Paupack Fish & Game Club, Life Member of the Wayne-Pike Penn State Alumni Association, and F. & A.M. Salem Lodge # 330. He and his wife Brooke reside in Hawley with their daughters Annie and Nora. A resident of West Scranton, Charlie is very active in his community. He is a flag football and little league coach in West Scranton and volunteers with many local charities.